The Rebel Sweetheart. 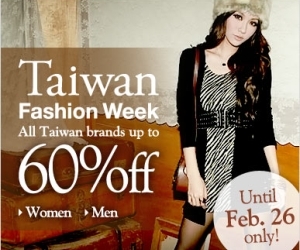 : Discount Shopping | Taiwan Fashion Week Sale. The YesStyle Taiwan Fashion Week Sale has been launched! All Taiwan brand products are up to 60% off. Plus, international express shipping is free on orders over $150! Sale runs until February 26th only. Add the code above upon checkout of your YesStyle purchases and get $5 off! Please note that a minimum of $10 purchase is needed for the use of this coupon, and is not applicable to the shipping charges. Offer is valid from February 23 - 29 only. interesting! kaso kelangan 150$ to get free shipping...will click on the link pa rin. lol.